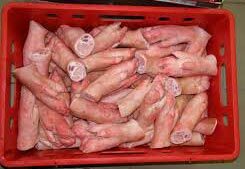 Frozen Pork Front Feet that we offer is gaining high popularity among buyers due to its purity, optimum quality, unadulterated nature, high nutritional value and longer shelf life. To retain its quality and purity for a longer period, we store Frozen Pork Front Feet in a cold storage space that has all the key facilities required for proper storage. Due to our highly advanced storage facilities, we have become the first choice for buyers when it comes to buying Frozen Pork Front Feet.